Who Is Alan Mulally And Why Should He Be Microsoft's Next CEO? Alan Mulally wasn't the first nor the most popular choice to take over Ford in 2006. But after an extreme turnaound, there's credible talk he could be Microsoft's next CEO. Who the hell is Alan Mulally? Here's what we know for sure: Mulally is on track to stay at Ford through 2014. Current Microsoft CEO Steve Ballmer is due to leave his post in the next few months. It's entirely feasible for Microsoft to have a seat-warmer until Mulally arrives. And remember, just because Mulally says he's staying through 2014 doesn't mean he will. Mulally famously said that Ford would re-invest and re-invigorate the Mercury brand. Then one day, Ford sent out a press release inviting journalists to join in on a conference call. After more than half an hour describing cheery news about the Ford brand, Mulally pronounced Mercury dead in less than five minutes. But who is Alan Mulally, anyway? Calling him the guy who saved Ford would be an understatement. He's the guy who changed Ford's internal management style, thus making the company's products more affable to the public. It's that kind of leadership Microsoft could use as it still tries to find stable ground with techies. Where does Mulally come from? Is he just a random gearhead? Mulally worked at airplane-manufacturer Boeing for 37 years, starting as an engineer and leaving as CEO. Boeing taught Mulally the importance of management structure and collaboration across workforces, which would be key to his transition to Ford. When he took over at Ford he knew almost nothing about cars. He knows a lot more now, but it would be hard to call him a "car guy." 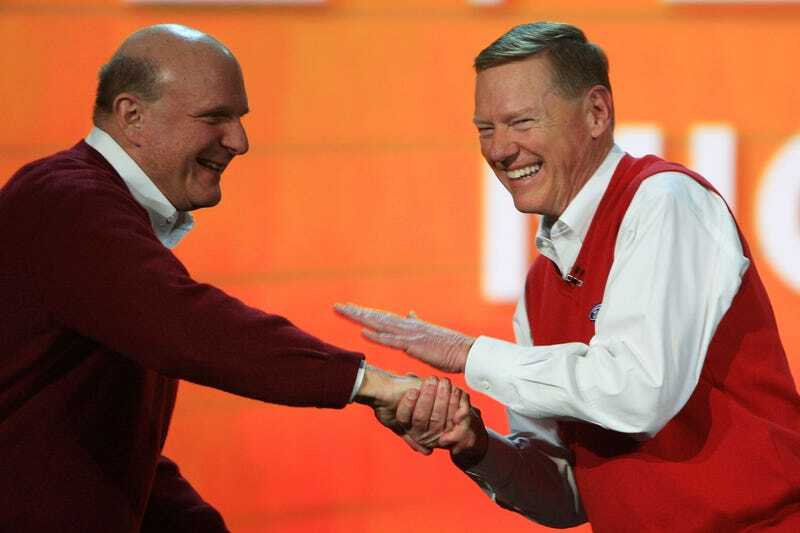 What did Mulally learn at Boeing that he could take to Microsoft? Boeing taught Mulally the importance of connecting people via multiple platforms, be it airplanes or automobiles. "Airplanes are some of the most sophisticated designs in the world, four million parts flying in formation, and it involves hundreds of thousands of people all around the world creating these vehicles. And the same is true now at Ford, with our full product line," he said. "Is the airplane really about an airplane or is it about getting people together around the world so they can find out how more alike they are than different? And is a car about just a driving experience or is it about safe and efficient transportation, and your family, and freedom? And so the higher the calling, the higher the compelling vision that you can articulate, then the more it pulls everybody in." If that last sentence doesn't sound like the words of a potential software magnate, we don't know what does. What were some of Mulally's key accomplishments at Ford? For one, Mulally restored the Taurus nameplate, replacing the Five Hundred. He sold off Jaguar, Land Rover, Volvo and Aston Martin to concentrate on Ford, Lincoln and Mercury. And he wanted to slim down the number of platforms Ford was currently running. "There's no global company I know of that can succeed with the level of complexity we have at Ford," he said shortly after starting the job. Above all, he changed the way things were done at Ford. He called for weekly meetings of top executives at 7 a.m. on Thursdays (he himself is said to arrive at the office at 5:15 a.m.) and other monthly gatherings for progress reports. He encouraged engineers and other employees to not be critical of being criticized, but instead acknowledge feedback. And he also made deep cuts and bold decisions in order to ward off a potential bankruptcy. So he really saved Ford from bankruptcy? Besides selling off its non-American luxury brands, Mulally put the automaker's intellectual property — including the Blue Oval — up for collateral. He continued to oversee layoffs and plant closings put in action prior to his arrival. Key products, including the Lincoln Town Car, ended production. And, of course, Mercury met its end. He took a ton of crap for all of this before the Carpocalypse and then, when Ford was the only Detroit automaker to not go bankrupt, many of those some people who critiqued Mulally lauded him as a hero. But is he suited for the Microsoft job? Unless you're Carlos Tavares, you're never supposed to broadcast your career ambitions to the world. Despite a hard-charging business nature, Mulally is decidedly mild-mannered and modest in person. And he's perennially optimistic about his goals in life, but admittedly not sure of his career path. "I’ve never laid out a career. I never said I wanted to do this job and this job and this job, and frankly, I’d propose that you really don’t know what a job is until you’re in it. The most important thing is that you are open to really understanding what is expected, and also where you can make the biggest contribution," he said. "The more humble you become, and the more honored you are to serve, it allows you to really understand what you can do to make a bigger contribution." Yes, he likes to make out with inanimate objects. Is the sweater... a joke? Did he lose a bet? No, he seems to choose to want to dress that way.